The SLO Bytes Digital Photography Group meets at Ralph Sutter's home. Go east through the village of Arroyo Grande on East Branch Street following the signs toward Lopez Lake. At the bus barn, take Huasna Road. 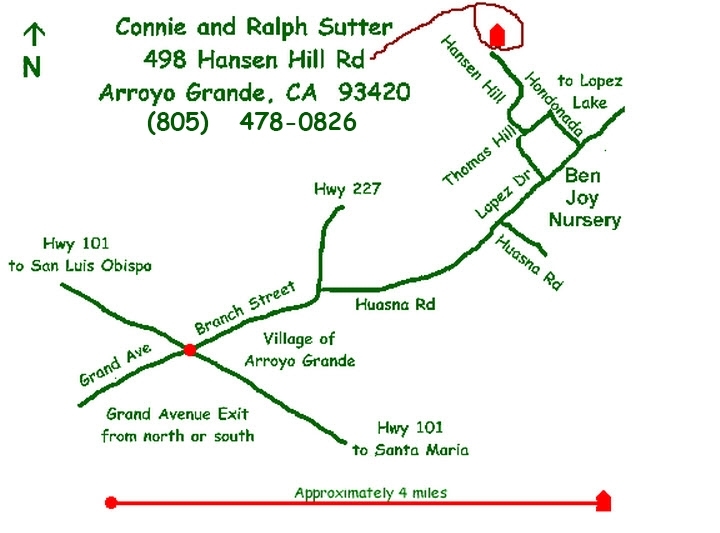 In two miles, when Huasna Road turns right and crosses the bridge, the road that does not cross the bridge becomes Lopez Drive. Continue straight on Lopez Drive just past the Ben Joy Nursery (on right) to Hondonada Road on your left. It is only 4 miles from the Grand Avenue exit at Highway 101 to our house and takes about 6 minutes.